Highway 101 exit Broadway and drive West. Turn left on Roemer Way and left on N. Roemer Court. Welcome to Candlewood Suites Santa Maria, CA! Visit Santa Maria, California's all suites, extended stay-hotel for business and leisure while traveling on California Central Coast. Suites feature a full kitchen (refrigerator, stove top, dishwasher, microwave, plates, coffee maker, silverware and cookware) plus a flat screen TV, DVD player, work desk, leather reclining chair and complimentary high speed Internet. 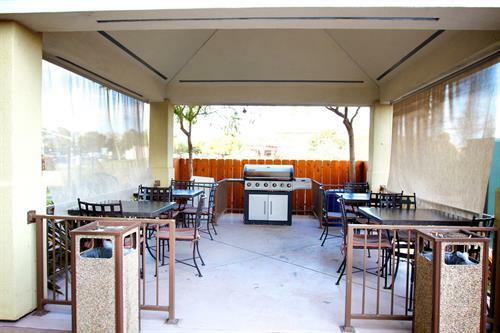 The hotel offers a free guest laundry facility, 24-hour fitness room, free high seed Internet, free DVD library rentals, BBQ area with gazebo patio & an on site convenience store. Candlewood Suites offers great relocation rates and welcomes corporate, military, senior and AAA guests. Candlewood Suites Santa Maria is close to many area attractions including Santa Barbara Wine Country, Santa Maria Speedway, Central Coast Sports Arena, Chumash Casino, Guadalupe-Nipomo Dunes, Pismo Beach, numerous area golf courses, restaurants, shopping and night life. This hotel is pet friendly. Our spacious studio suites feature a distinct sleeping and living areas so you can separate bedtime from work time. Living space includes a sofa sleeper. Never miss a workout while traveling! 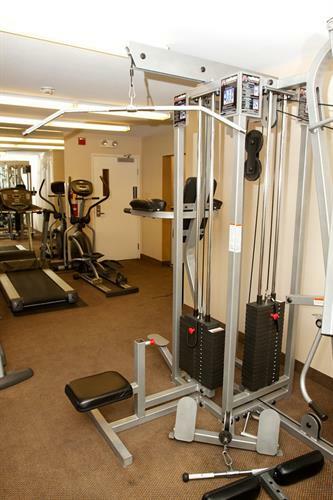 Enjoy our well appointed, complimentary fitness center. The Cupboard - on site market offering snacks, beverages, frozen entrees, fresh fruits and more! Open 24/7. Complimentary Business Center offering guests free high speed Internet, a PC, printer and copy service. Fax service is also available. Welcome to Candlewood Suites Santa Maria, CA! Hotel front desk and free DVD Lending Library. Each suite provides a DVD Player!